Inspired by a true anecdote, this larger-than-life tale of a presidential mishap is brimming with humor and over-the-top illustrations. "Blast!" said Taft. "This could be bad." George Washington crossed the Delaware in the dead of night. Abraham Lincoln saved the Union. And President William Howard Taft, a man of great stature — well, he got stuck in a bathtub. Now how did he get unstuck? Author Mac Barnett and illustrator Chris Van Dusen bring their full comedic weight to this legendary story, imagining a parade of clueless cabinet members advising the exasperated president, leading up to a hugely satisfying, hilarious finale. Mac Barnett is the author of several books for children, including Extra Yarn, illustrated by Jon Klassen, which won a Caldecott Honor and a Boston Globe–Horn Book Award. He also writes the Brixton Brothers series of mysteries. Mac Barnett lives in California. Chris Van Dusen is the creator of many outstanding books for children, including Randy Riley’s Really Big Hit, King Hugo’s Huge Ego, The Circus Ship, and many others. 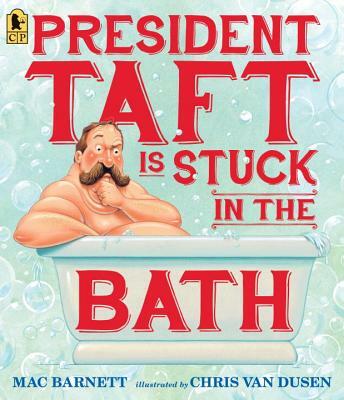 About President Taft Is Stuck in the Bath, he says, "This is just the kind of outrageously silly story I love to illustrate. Plus, President Taft was a blast to paint!" Chris Van Dusen lives in Maine. [A] delightful, smart, and silly story about the most famous bathtub misadventure in U.S. presidential history. Chris Van Dusen’s bold gouache illustrations make eager use of double-page spreads, creating the scene and capturing the sly jokes and apt personifications within Barnett’s rhythmic prose. These larger-than-life renderings and the no-nonsense dialogue perfectly suit the occasion, juxtaposing the grandeur of the White House with the exposed Taft... Fleshy, funny, and fact-checked, this perfect Inauguration Day readaloud will plump up any presidential collection. Van Dusen depicts the mustached, apoplectic president scrunched with knees to chest; in gouache caricatures, he emphasizes Taft's ample flesh and visualizes the staffers' dubious solutions (such as greasing the tub with fresh-churned butter or blowing it "into smithereens"). ... [T]here's no denying the riveting spectacle of Taft's struggle. Barnett spins a probably apocryphal but nonetheless hilarious incident into a Cabinet-level crisis. ... The soapiest, splashiest frolic featuring a head of state since Audrey and Don Wood’s "King Bidgood’s in the Bathtub" (1985). This larger-than-life example will provoke much laughter. ... Van Dusen’s spread of cascading water pitching Taft’s posterior into the air and out the window will surely please the intended audience. The energy in the gouache compositions, dominated by a presidential blue, comes from the motion lines around the frustrated, fleshy, quadruple-chinned head of state, as well as the preposterous solutions proposed. The combination of Barnett’s repetitive assonance and Van Dusen’s gouache caricature illustrations (with strategically placed water and bubbles) sets the hilarious tone. A concluding author’s note reveals an archival photo of four men sitting in Taft’s custom-built bathtub for the White House and presents the actual facts pertaining to the president and his numerous commissioned bathtubs. Studying the presidency need never be dull again. The illustrations perfectly match the tone and tenor of Barnett’s words. Taft is depicted in all his large, naked glory, but the illustrations give the President an air of authority and dignity. The book itself is physically large, though Taft is largest of all, filling up his spacious bathroom with his voluminous body and endless cacophony. Kids will enjoy the humor and energy in this story and be intrigued by the notion that presidents are people, too. Each page is a deliciously smooth (like chocolate!) series of illustrations of the drama — images where the rolls of flesh almost become animated themselves. How did Van Dusen do it? ... He makes the most of Mac Barnett's hilarious, imaginative and yet still respectful tale. ... This book rewards readers of all ages. The funniest kids' history book we've seen in a while. ... Lots of silly fun. Van Dusen's exaggerated gouache illustrations contribute to the author's merry absurdities. The text is humorous and early 20th century-sounding, with oversized illustrations and suit the subject perfectly.